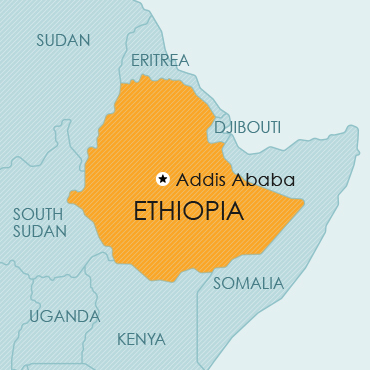 Ethiopia is a land-locked country situated in East Africa. Sudan and South Sudan lie to the west of Ethiopia; Kenya to the south; Somalia and Djibouti to the east and Eritrea to the north and beyond these countries the Red Sea. Ethiopia is not a member of the Paris Convention, nor of the Madrid Agreement/Protocol nor the WTO/TRIPS. Trade marks may be registered in respect of goods and services. The law also provides for the registration of collective trade marks. Ethiopia is not a member of the Paris Convention, nor of the PCT or the WTO/TRIPS. However, priority is afforded on the basis of a first-filed application in another country. Patent protection is obtainable by way of a patent granted on a national filing. A patent is granted in respect of an invention which entails patentable subject matter. A so-called patent of introduction (or importation) is granted to an invention which has been patented in another country where such patent has not yet expired (the period of protection being limited to 10 years). So-called minor (or petty) inventions may be protected by utility model certificates. Ethiopia is not a member of the Paris Convention nor of the WTO/TRIPS; yet the law and the Ethiopian registry recognises a claim to priority rights provided the application is filed within six months of the first-filed corresponding application. Protection may be obtained for an industrial design by way of a design certificate. Design protection does not extend to any feature of the design which serves only to obtain a technical result. The Proclamation provides protection for copyright works, and also protects the rights of performers, producers of phonograms, and of broadcasters. Ethiopia is not a member of the Berne Convention nor of the WTO/TRIPS. collections of works, collections of mere data (databases), whether readable by machine or other form. Ethiopia is not a member of the UPOV Convention for the Protection of new Varieties of Plants. to produce, including the right to license other persons to produce, propagating material of the protected variety for sale. Other persons are prohibited from carrying out these activities without the authorisation of the right holder.